ASOS is a well-established British fashion brand that offers celebrity and trend driven styles that are young, fun and edgy. The brand incorporates a wide range of different looks, whether you're seeking an elegant dress for a party or a cool jacket for the weekends. The jumpsuits line includes a broad selection of styles, from sleek full-length jumpsuits, through to short, flirty playsuits. Halternecks, keyhole detailing, lace panels and scuba sweat fabric are just some of the details that help make the designs unique, as well as a range of fun prints from bright daisies to dark, romantic florals. 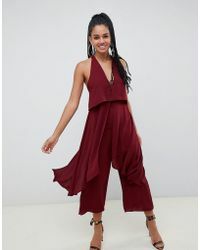 Showing 3,409 results for "Women's ASOS Jumpsuits"